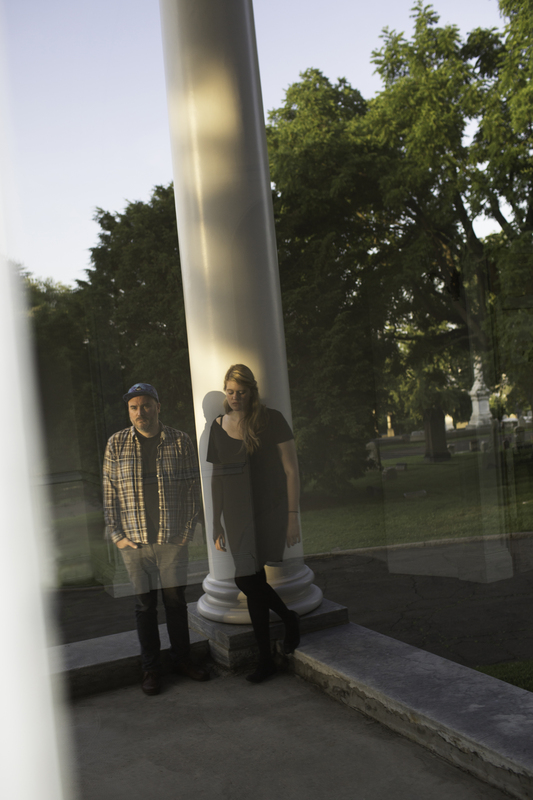 Interview with Mary Lattimore & Jeff Zeigler. 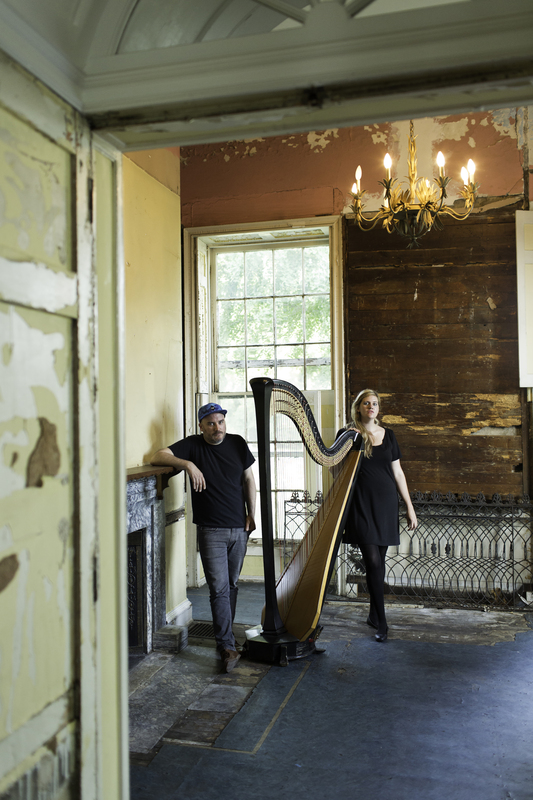 Earlier this autumn marked the highly-anticipated release of the special collaborative work between Philadephia-based harpist Mary Lattimore and multi-instrumentalist Jeff Zeigler on the prestigious Thrill Jockey label. The debut album, ‘Slant of Light’ is a mesmerising collection of four stunning improvisations, built on the immaculate instrumentation of synthesizer, guitar and harp that seamlessly taps into a divine state of transcendence. An other-worldly feel permeates the rich tapestry of ‘Slant of Light’s sonic canvas as a deep telepathic connection is forged between the gifted duo. In many ways, the pair’s collaborative work began with 2013’s ‘The Withdrawing Room’ – Lattimore’s debut solo record- which Zeigler recorded and mixed, as well as adding synthesizer parts to the epic ‘You’ll Be Fiiinnne’. ‘Slant of Light’ represents the latest chapter in the pair’s musical journey that continues to explore new sonic terrain; delving wonderfully into realms of folk, ambient and drone soundscapes. The opening ‘Welsh Corgis In The Snow’ is a slow, meditative lament that contains gorgeous harp arpeggios and gentle pulses of synths, resulting in a haven of celestial sounds. A drone infused ambient opus unfolds with each sacred note. ‘The White Balloon’ immediately transports me back to cult singer-songwriter Ed Askew’s ‘For The World’ album (a record Lattimore collaborated on) as a timeless folk gem ascends into the atmosphere. The voice of Askew feels just a heartbeat away. The synthesizer parts become more pronounced on the record’s part B, particularly on ‘Echo Sounder’. The closing ‘Tomorrow Is A Million’ explores deeper into sonic experimentation as an eerie feel exudes from the scintillating soundscapes. Both artist’s highly collaborative pasts forms a trajectory to many of the indispensable records of the U.S independent music scene. Lattimore has recorded with Kurt Vile, Meg Baird, Steve Gunn, Ed Askew, Sharon Van Etten, to name but a few after years of touring with Thurston Moore. Zeigler has played with members of Chris Forsyth’s Solar Motel Band, The War On Drugs and A Sunny Day In Glasgow in his group Arc In Round. In addition, Zeigler is the much-sought-after recording engineer in the heart of the Philadelphia music scene, recording for artists such as Kurt Vile, The War On Drugs, Nothing and Purling Hiss. Congratulations on the wonderful collaborative project. ‘Slant of Light’ is a really special record that that transports you to a magical realm of treasured sounds. On your own solo record “The Withdrawing Room”, Jeff is also present on the recording sessions so it feels very natural (and fitting) that this duo has been officially formed. Firstly, please discuss the collaborative process between you both and how you have developed such a deep understanding of each other’s music? Has the process changed in any way between ‘The Withdrawing Room’ and ‘Slant of Light’? Mary Lattimore: Jeff recorded ‘The Withdrawing Room’ and played synth on the first piece and we’ve been playing together since then, realizing that we really like improvising together. With ‘The Withdrawing Room’, I was playing, he was in the control room playing, with the door between us closed. I asked him to add a few things, just experimenting to hear how different sounds could enhance the harp record. He played synth, but it didn’t feel like a collaboration like this one is. ‘Slant of Light’ was recorded after lots of shows and some travelling together, so it feels more conversational and informed. It’s still an experiment, but we’re more comfortable with each other and know how to react to where the melody is being taken. This time we were in the same room! Jeff Zeigler: The first time I worked with Mary was on the day that we began recording ‘The Withdrawing Room’. The vibe was really low key and she asked me if I’d like to play on one of the pieces and I just tried to add an extra level of atmosphere and reinforce what she was already doing without stepping on it — it was a really effortless first collaboration, so I think we both felt that it made a lot of sense to continue in that fashion. The process changed really significantly after we wrote our score for ‘Le Revelateur’ — up until that point I had focusing more on texture and atmosphere than melodies, which was one angle, and definitely made everything a bit more droney and hypnotic, but when it came time to write instead of free improvise, it seemed to make far more sense to focus on creating memorable haunting melodies that glued together the harp and textural elements. So yes, the process has changed significantly on my end. ML: You know, none of this one was really composed either. We just sat down, I thought of a little opening part, Jeff figured out the key, we were just going for it. The pieces are all first or second takes. They do feel a little more song-y, but it’s all just ideas that we were just feeling out in the moment, trapped in Jeff’s studio during this huge snowstorm for two days. I think the time of year really affected how the ideas were coming to us in those few days, with no light distractions of a lovely summer, just sloshing through the relentless, endless winter of 2014. JZ: The album is essentially all improvised aside from ‘The White Balloon’. Mary or I would start playing something, the other person would join in, and then we’d jam it out for an unspecified amount of time. Afterwards, we’d usually discuss it for a minute, maybe figure out a few different things to try or talk about the structure and then try a second take. I don’t think any of the pieces on the album, aside from ‘The White Balloon’, made it past a third take before we were satisfied with the results. I feel part B is more improvised-based but certainly the first two tracks seem to have been mapped out before the sessions took place. The opening ‘Welsh Corgis In The Snow’ is such a beautiful title and I love how the gentle arpeggio of harp notes blend effortlessly with the synth pulses. I would love for you to talk me through this particular harp-based composition, Mary? What are your memories of writing this piece of music? ML: I wish I could say that I put lots of brain-effort into the composition, but really, I think all of the songs came directly from our human hearts! Haha. I thought of the beginning part and then where it would go, with those low notes in a chorus, and then just started slowing everything down and Jeff did too. It was an intense few days – I packed a bag and spent the night in the studio where Jeff lives, as more heavy snow was expected. The next morning, we’d found out that a friend had passed away and I feel like all of the elements were there to translate some feelings, making something that marks a point in time for both of us. Jeff will be happy to hear that you like the title! He made it up! Jeff and his cute dog Baxter like winter and I’m glad he gave it a cheerier title than something goth-y I would’ve given it. I’m from the south and I go real darkside when it’s cold! JZ: The track starts with my Korg Mono/Poly slowly fading in and droning. My whole setup is going through a Roland Space Echo tape delay, and I’m making slight adjustments to the rate of the delay by hand, which creates a woozy, seasick feel by minutely altering the pitch of the synth drone. Mary starts playing on top of that, and in another minute or so I add an octave up pitch shift, which opens up the sound, and then I start looping and layering the synth and Mary begins adding in tweaked-out harp delays. I honestly don’t remember what’s going on with acoustic strumming noises that you can hear in the room. I think I may have been playing a psaltery and just strumming it open somewhat randomly? The track becomes a bit more static around the 4 minute mark and both Mary and I are tweaking our pedals. At 4:15 or so introduce a melody on processed melodica that I continue playing and looping for the next few minutes. Elements then gradually strip away until you’re left with the initial drone and the new melodica melody, and the track fades out on the Mono/Poly drone. Mary, you have been involved in an endless array of utterly compelling collaborations, having recorded and performed with Kurt Vile, Meg Baird, Ed Askew, Steve Gunn and Thurston Moore to name but a few. These projects must be so rewarding and fulfilling to be part of. How do these collaborations feed its way into your own music and music-making process? Are there certain parallels you see that exist between these collaborations? Can you shed some light please on what collaborative works will next see the light of day? ML: I love both collaborating and contributing to other people’s songs, writing parts. It’s fun to see how people you admire work, to see behind the curtain, to be a part of the process. For me, it doubles the magic of it, when you get to see the human trial-and-error, the scrapping something, and the million takes, and the finally getting it. I love the sitting around listening to what somebody else is doing, listening back to your overdubbed part, and trying it again but up an octave, listening back, over and over. On my own record and for this duo one, it’s a totally different process, where it’s all exorcism and improvisation, but I also love the perfectionism of working on someone’s thought-about song, and witnessing the deliberate series of choices that are being made. All the little choices, capturing a vibe and sharpening a song. Working on the new Steve Gunn record was a total feelgood delight, up at Black Dirt in upstate New York. The musicians were next level, a solid group of talented people. I just had the pleasure of making a harp and koto record with this friend Maxwell August Croy. It’ll be out next year. That one was improvised. Jeff, as a recording engineer you have recorded albums for musical luminaries such as The War On Drugs, Kurt Vile, Nothing and Purling Hiss. I would love to gain an insight into this aspect of your work. Are there certain rules or beliefs you abide by and stick by when recording? Also, I would love to know how early in life did your fascination with sound begin? Can you pin-point the moment you realized music would be the path for you to follow? JZ: There are certain sounds and techniques that I gravitate towards, and people tend to come to me for that aesthetic, but to not break your own rules every once in awhile would be pretty limiting and counter-productive. I guess what generally appeals to me is what’s fairly evident on ‘Slant of Light’— a combination of the organic and the inorganic helping to create a unique and somewhat unidentifiable space. I’m a huge fan of luring people in with a familiar sound and then “enhancing” it in such a way that either accentuates its’ beauty or warps it in such a way that creates a sense of unease. Or maybe takes you to a place that’s less literal place then the elements suggest on their own. I think the point at which I realized that there was no turning back was when I began playing guitar again in college and would borrow the school’s 4-track cassette recorder and just experiment with different recording techniques and unintentionally started incorporating a lot of “concrete” techniques into my songwriting, making the two somewhat permanently intertwined in my mind. ‘The White Balloon’ is yet another stunning tour-de-force. The music evokes moods and colours in much the same way a beautiful landscape painting would create. I imagine the voice of Ed Askew will appear at any moment during the meditative harp passages- returning nicely to a previous collaboration of yours with ‘For The World’. What are your memories of writing this particular piece of music? Somehow I wanted for us to make something that represented flight, maybe some kind of enlightenment, getting lighter. I love Jeff’s playing on it. My Granny had also just died, too, so I think the piece was kind of influenced by recent ghosts of beautiful people. There’s a really nice music video for it, created the wonderful Naomi Yang (www.naomivision.com) and it was shot in my hometown, Asheville NC, at my Granny’s cabin. The cover painting is by Philadelphia-based artist Becky Suss, whose stunningly beautiful work also graces the sleeve of ‘The Withdrawing Room’. Please talk me through the concept of this artwork and indeed your fascination with her work? It’s so very distinctive and unique, I’m very glad to have come across her work through your music. ML: Becky is so talented!! She is amazing. Her work on both covers has gotten so many compliments and I feel really fortunate that she’s been so generous. I think the worlds match well, hers and mine/mine and Jeff’s. They just make sense together. 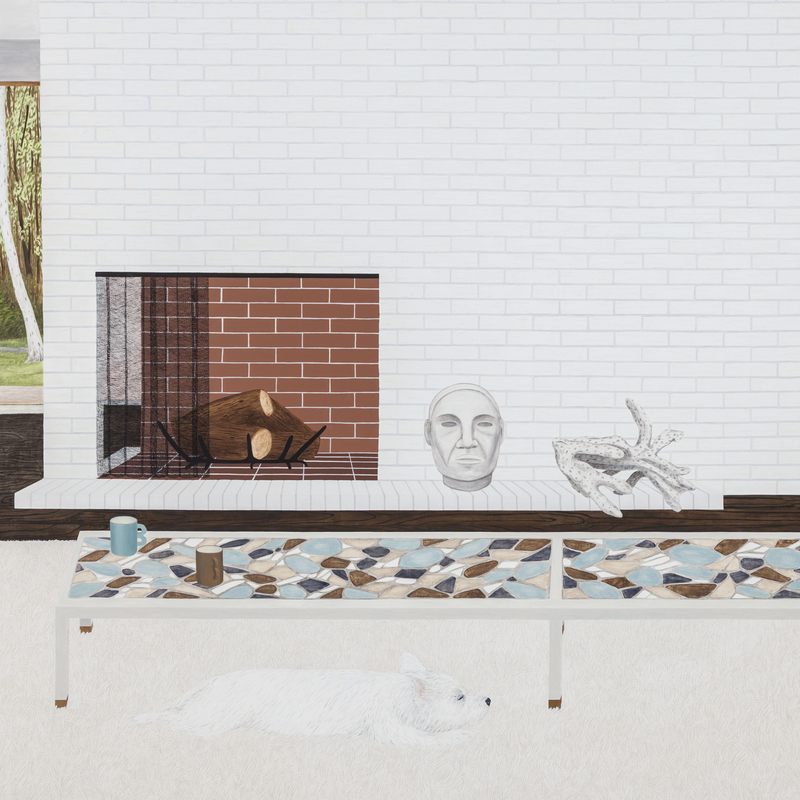 A lot of her paintings are of rooms of her grandparents’ house. The style reminds me so much of a beautiful Frank Lloyd Wright house or something. Nature, collections and treasures, clean shiny big windows, weird sculptures, thoughtful and layered memories of an empty house – I feel like I can smell what the house smells like just looking at them. It was, sadly, demolished and she’s painted from her memory of it. Her website is www.beckysuss.net. The best. Please discuss the current music scene in Philadelphia, Mary? What a time it is right now with the likes of The War On Drugs – as ever – going from strength to strength. ML: My friend Kathryn just put on the greatest event of the summer, the second Kensington Picnic. All of the buddies from the neighborhood came out and lots of good genius friends played – Laura Baird, Fursaxa, Randall of Nazareth, Spacin, Hohlraum, Strapping Fieldhands, the amazing Birds of Maya, and Jeff and I played too. We have a great community in Philly. Our great pals Purling Hiss have a record coming out on the same day as ours. Yeah, War on Drugs are killing, Kurt Vile and those guys are gonna be working on a new one, Chris Forsyth and his Solar Motel band are always awesome, Jeff is working on a great solo record, Watery Love are gonna be playing the night before my birthday, so that’ll be a treat. Feel lucky to know a ton of sincerely creative, driven people and it all feels really supportive. JZ: Philadelphia’s music scene is pretty insane right now! There are so many great bands and artists working on so many different fronts and it makes me really happy. There’s generally a ton of support and positivity and a bunch of different scenes that exist outside of each other but still tend to cross-pollinate to some extent. There are some exciting newer bands — Amanda X, White Lighters and Myrrias spring to mind, and also a bunch of lifers like Chris Forsyth, Purling Hiss, Kurt Vile, the War on Drugs guys, etc that are just doing what they do and have been for ages because it’s their thing. I think the fact that Philly is still relatively cheap and very central just draws a lot of people to it who have a common purpose. It’s getting increasingly gentrified, which worries me, but I think we’re safe from getting as soulless as New York has for at least a few decades. Jeff, your band Arc In Round creates such a mesmerising wall of sound. Please discuss the inception of this band and plans for an upcoming release? JZ: Thank you! We are unfortunately on a semi-permanent hiatus. I’m currently recording an amazing LP for Myrrias, the new band of Mikele Edwards, who was the other creative half of Arc in Round, and I’m in the process of finishing up a solo LP that’s sort of in line with the AiR material, but aside from the occasional show and possibly a loose album of extended improvised music I don’t foresee us doing much. I should have this new as-yet-unnamed project up and running in the Spring and am also currently working on a beat and sound design-heavy record that will probably include some pretty great Philly rappers on it too. Last December, the both of you performed a live score for Philippe Garrel’s 1968 film ‘Le Revelateur’ in Marfa, TX. Can you please recount your memories of this particular night? What is the process and experience like when performing a live score to a film? Do you have plans to do this again in the near future? I hope you and Jeff tour this new record of yours, before too long. ML: Yeah, we definitely have plans to tour! We played the score with the film in Philly and Chicago in September. We’ve been on tour with Steve Gunn for the first two weeks of October, which has been real cool, but not with the film. We were asked to compose and perform a score for a silent film for Marfa’s annual event that happens around New Year’s Eve. Jeff and I got together and wrote some themes that corresponded with images and scenes, with bits of improvisation connecting the themes. The film is very beautiful and strange, intentionally silent, but we were able to get Garrel’s blessing. I’d never been to Marfa before (Jeff had been there with his band Arc in Round) and so it was such a treat to check out that little town in a new part of the country. Saw my first shooting stars out there!! It worked out really well, I think, and we’re looking forward to diving into the film again and getting reacquainted with the music we wrote. JZ: It was amazing! Nicki Itner and everyone else from Ballroom Marfa are great people and were such a pleasure to work with. It was all a bit of a whirlwind, as it was only the second time we had played along to the film on a large screen instead of a laptop, so it was harder, for me at least, to recognize cues, which was slightly nerve-wracking but once we started everything fell into place pretty naturally. Process-wise, things worked in a manner that’s fairly similar to how we wrote the album: one of us would come up with a part for a scene and the other person would try to enhance it, we would go through the scene, discuss what worked and what else we might be able to do, and then go from there. Since it’s all semi-improvised there’s a bit of wiggle room…..but not much. ‘Slant Of Light’ is available now on Thrill Jockey Records.